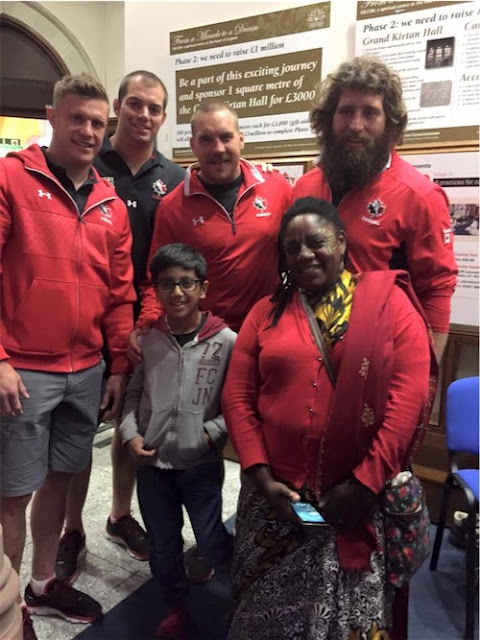 Canada Rugby Team Visits ISKCON Leicester (UK) ~ The Toronto Hare Krishna Temple! The Canada Rugby World Cup Team attended the ISKCON Leicester Kirtan Fest this Sunday 27th September. The Canadian Team, who are in the UK for the World Cup tournament, were walking through Leicester’s City Centre, when they heard the sound of kirtan coming from the magnificent temple. Ananda Monet was leading a beautiful kirtan, and they were warmly welcomed by Leicester’s Bhakta Ash. Still in their red training tops, the rugby stars enquired about the festival, the significance of the Hare Krishna mahamantra, and about the ISKCON Centre in Leicester. In his usual, friendly way, Ash asked them to read and chant the Hare Krishna mahamantra, which they did so happily. The Canadian Team then met some devotees, and spoke to young 8-year old devotee who also plays rugby in Leicester. The devotees wished them the best of luck for their upcoming games in the Rugby World Cup.